These Questions are asked on ESIC staff nurse exam 26/2/2019 at 4.30-6.30pm shift, here is third set of 25 nursing questions and answers are included. The following are the important preoperative nursing care for a patient with benign prostatic hypertrophy, except? The drug of choice to treat Bulimia nervosa is? Inborn errors of metabolism are the following, except? 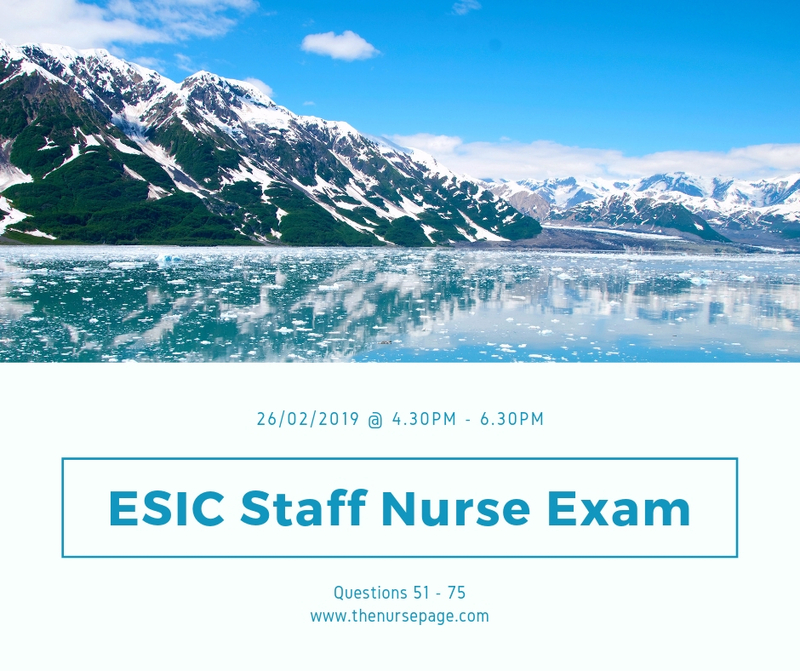 Patient with complaints of pain and has redness with swelling at the site of IV, the nurse must? Behavioral clues of impeding suicide are as follows, except? False labor manifestations are as follows, except? Potential adverse effects of surgery and anesthesia are as follows, except? Vital statics include the following, except? In the liver bacteria that found their way into portal circulation is destroyed by? Reye’s syndrome is associated with? Health maintenance program for older people in the community are as follows, except? The patient with appendicitis usually exhibit the following clinical manifestations? The main cause of genital warts(Condylomata Acuminata) is? Considering the chain of infection, a reservoir might be? Cardiogenic shock is precipitated by? Gestational diabetes increases risk of following, except? The extracellular fluid includes the following except? The patient who has an appointment for a Pap smear should have been instructed? When assessing physical development of the five year old, you would find it abnormal if he? APGAR score is considered excellent if the score is? Bulging sack like lesion filled with spinal cord element is? Artificially acquired immunity is obtained by? Role of community nurse in school health program, except? When considering the principle of growth and development, remember that? The charecteristics of lochia rubra is? After scoring on the next page, click “Give Me More”, we have recommendations for you!